Based on poet Ted Hughes' 1968 children's book, former Simpsons producer Brad Bird's adaptation proves to be a work of art the family can enjoy together - simple and visually captivating enough for kids and sharp and touching enough for adults. Hogarth is a young boy in 1950s Maine. When he finds a kind and very large robot (of unknown origin), a strong bond of friendship is formed between the two. It isn't long, however, until a government agent is on their trail, wanting to destory the robot. A beautifully rendered fable. $5.732 million on 2179 screens. Early word on 1999�s The Iron Giant - an adaptation of Ted Hughes' 1968 novel - said it was terrific, and when it hit the screens, the critics agreed. 1999 offered a lot of well-received animated movies, but Giant may have garnered the best notices of them all, although Toy Story 2 may actually have surpassed its critical approval. Unfortunately, audiences didn't notice and Giant suffered from an ignominious fate. Despite all the glowing reviews and the ecstatic word of mouth, nothing could save the film at the box office. After an anemic gross of about $23 million, the movie disappeared from theaters. Gone, but not forgotten, as Giant maintains avid fans who still proselytize about the movie. I don't know how it's done on home video, but I'd guess fairly well, and I'd be surprised if it hasn't succeeded above a level one would expect from such a box office bomb. One problem with all the raves is that they set up the viewer for an experience that the film itself may not be able to match. That's the danger of hype, and although it was small-scale for Giant, the film received a lot of secondary hype nonetheless. That was my position when I saw the movie theatrically last summer. As a result, while I enjoyed the film, I couldn't help but wonder why it received such acclaim; it was a well-executed picture but I didn't think it was anything special. Now that I've seen Giant again, my opinion hasn't changed much, but I definitely liked the movie more the second time. It still isn't one of the all-time great animated films, but it is a charming, fast-paced, witty and moving little offering. 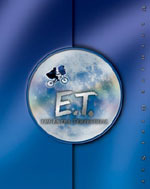 One interesting aspect of the film is that it possesses many parallels with ET. Normally I'd scream "rip-off!" and leave it at that, but this situation is a little more complicated since Giant adapts the 1968 book. As such, that story predates E.T. by 14 years, so it's altogether entirely possible that the Spielberg classic stole ideas from the book. I haven't read it, so I don't know this, but suffice it to say that whichever came first, the 1999 movie of Giant presents a lot of scenes that are strongly reminiscent of those in E.T. Even if Giant does steal from the earlier alien-related film, it still offers enough of its own to make it enjoyable. For one, I thought the voice acting in Giant was just terrific. The cast includes a nice complement of different folks who all add up to one terrific bunch. We get Jennifer Aniston playing against type as the mother of our protagonist Hogarth, plus Harry Connick Jr. working with type - but still effectively - as beatnik artist Dean, Christopher McDonald as government heavy Kent Mansley, and John Mahoney as military not-so-heavy General Rogarde. All are splendid. Best of the cast, however, are our two main characters, Hogarth and the Iron Giant himself. Vin Diesel plays the Giant, and although I thought his vocals were heavily affected by electronic tampering, a viewing of the DVD's documentary disavowed me of that notion quickly. Oh, there's definitely been some sweetening, but I was shocked to hear how effectively Diesel could do the metallic, gravelly voice without help; it's a great performance that adds a lot of charm and character to the Giant. The animation in The Iron Giant isn't the best you'll see, but it's very good in its minimalist style. It serves the piece nicely and creates a somewhat unique atmosphere. Some of the best aspects of the animation regard the Giant himself. For one, I thought his character design was marvelous; all at once, he can be adorable, ominous and intelligent, which can be quite hard to pull off as a combination. Additionally, the Giant is one of the best-integrated pieces of computer animation I've seen. Many largely traditionally animated films feature CGI that stands out like a sore thumb; Prince of Egypt suffered from this, and even Tarzan presented some backdrops that just don't blend all that well with the rest of the action. Such a problem does not affect the Giant. Really, I thought the character - who apparently was completely computer-drawn - melded flawlessly with the rest of the cel-based animation. If I didn't know computers did the Giant, I wouldn't guess it from the way he so neatly matches the rest of the art. Despite my initial misgivings, I ultimately find The Iron Giant to be a very satisfying and enjoyable little film. I have to join the chorus of folks who don't understand why it did so badly at the box office; the movie's a treat. 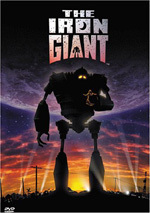 The Iron Giant appears in both an aspect ratio of approximately 2.35:1 and in a fullscreen version on this double-sided, single-layered DVD; the widescreen image has been enhanced for 16X9 televisions. Only the letterboxed picture was reviewed for this article. Across the board, the movie looked great. Sharpness seemed consistently strong. Only a sliver of softness interfered on a couple of occasions. 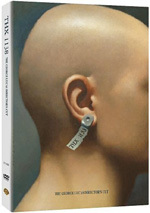 99 percent of the time, the film remained concise and well-defined. No issues with jagged edges or shimmering occurred, and I also noticed no edge enhancement. Print flaws remained absent, as the movie failed to display any specks, marks, or other concerns. Giant featured a broad and mildly rustic palette that highlighted reds and oranges. Along with the occasional glimpse of �futuristic� blues, we got forest greens, and the colors always appeared excellent. The hues always came across as firm and dynamic. Blacks looked deep and dense, while low-light situations appeared smooth and well-delineated. Overall, I thought Giant offered an excellent transfer. The Dolby Digital 5.1 soundtrack of The Iron Giant succeeded in general, but it suffered from one huge flaw: the dialogue. I can't recall another modern film with such muffled speech. At times it seemed relatively distinct and clear, but for the most part, I thought dialogue sounded really flat and dull. I understood what the characters said, but the poor quality made it much harder to buy the illusion of the animation; the entire presentation seemed "off" and the audio really distracted me at times. This became especially noticeable during louder scenes. During those instances, the muddy speech was very hard to hear. Otherwise, the sound seemed very good. The forward soundstage was well-defined and audio appeared neatly placed. Some smooth panning could be heard, and the entire package blended well. The track didn�t use the surrounds relentlessly, but they added some useful auditory information and meshed well with the entire proceedings. Except for the dialogue, audio quality was positive. The music fared well, for Michael Kamen's score came across as clear and crisp. Effects were nicely realistic and detailed, and they presented some deep bass. Low-end was tight and distinctive. It�s a shame that the speech problems occurred, for they caused the mix�s only real problems. Without them, this could have been an �A�-level track, but as it stood, I didn�t think it merited anything above a �B-�. 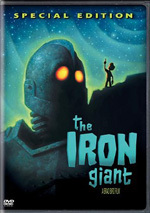 Of most interest is a decent 22-minute documentary called The Making of The Iron Giant. This clearly is a promotional piece; in fact, it originally appeared on the WB Network prior to the film's August 1999 release, and we still hear host Vin Diesel mention the channel in the comments he makes prior to what would have been commercial breaks. The program offers the usual m�lange of film clips, behind the scenes footage and interview snippets with the cast and crew. The interviews are fairly dull, since they're generally informational in nature; after all, everyone wants to let the public know about the film. Unfortunately, we already know about the film, so the effect is lost on us. Obviously, this makes the film clips a waste of time as well. However, the behind the scenes shots are fairly interesting. We get to see the voice actors at work, and we also witness the crew putting the project together. There's not much here that will be news to animation buffs, but it's a pleasant and relatively fun program. The film's too-revealing trailer also appears, as well as a music video for Eddie Platt's period song "Cha-hua-hua". In that clip, only movie snippets accompany the music. I assume that's because it's hard to get the original artists to perform along with a song when it's 41 years old. Finally, we find some very basic biographies for nine actors and five crewmembers; filmographies without bios also appear for four of the actors. Despite those flaws, this DVD does the most important thing right: it offers a very good movie. The Iron Giant is a delightful and charming film that seems certain to stand up to repeated screenings. Picture quality seems excellent, but poorly-recorded speech mars the audio, and the supplements seem mediocre at best. If this were the only version of Giant on the market, I�d still recommend it. However, we now have a choice with the 2004 release of a special edition. It presents picture and audio identical to those found on this release, but it adds some stronger extras. It�s definitely the version to get.